Parenting is a humbling experience. Pardon my surprise, but I didn't realize how much I needed to changegrow to do this job well. I figured since I had my kids "later" in life, I had a better handle on my emotions and better control of my tongue...which would make parenting much easier. How hard could it be? I had good parents, I knew plenty of good parents, PLUS I was mature - so I was ready, right? Parenting is like living life in front of a huge mirror with GIANT florescent light bulbs. There's nowhere to hide, and what I see of myself isn't always pretty or presentable. Parenting reflects every thing about me back at me: good, bad, and ugly. Like most (all?) parents who have skills that are decidedly mixed (which mine are), I'm learning valuable lessons along the way. For instance, perhaps the most "practiced" lesson these days is improving my apologizing skills. That makes sense. Parenting has a steep learning curve, and any failings and shortcomings negatively impact others. And, if you're like me, there are many days when our kids deserve an apology for a "less than ideal" parenting move. Oddly though, I find that most parents don't apologize to kids very often. I imagine the oversight happens for the same reasons that many bosses don't recognize their shortcomings in front of those they lead. Maybe it is pride, or a fear of losing power, or simple inattentiveness. In any case, "I'm sorry" truly seem to be the hardest words. (Props to Elton). I'm trying to apologize more to my kids these days. Here's a quick run-down of why. Much of my parenting comes in the form of teaching and correcting my kids. "Don't use that tone of voice." "Is that a nice thing to say to your friend?" "Try asking for ____ again, with nice manners." "Can you talk to her without sounding so angry?" Billy tells a story about a mom who gets fed up listening to her kids arguing in the other room. She snaps, barges into the room and yells, at the top of her lungs, "I WILL NOT TOLERATE SCREAMING IN THIS HOUSE!!!" In that moment, she is modeling exactly the opposite of what she is teaching. That's the kind of response I can relate to. If I'm not careful, I fail to look at my own behavior through the same demanding standards that I place on my children. When that happens, especially as my kids are growing older, they easily can see ME when I'm not demonstrating the same behavior I am asking of them. Those are the moments where my kids learn the meaning of " hypocritical." So, knowing that, I decided that I have to apologize when I'm out of line. In doing so, I've learned a few things about why apologizing is a good thing. Behavior Modeling - A well-placed apology follows a moment when the WRONG behavior was modeled and counteracts it by demonstrating the RIGHT behavior. If we want our kids to own their mistakes, we need to show them how we own OUR mistakes. The best way to do that is to say, "I was wrong" when you are wrong! Relationship Restoration - One of the top complaints of teenagers (from our years of working in student ministry) is, "My parents think that they are ALWAYS right." Translation: "My parents never admit when they are wrong or even might be wrong." 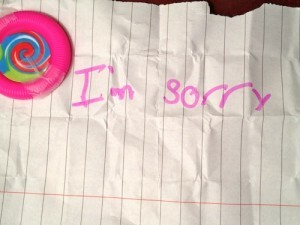 While failing cause fractures in relationships, apologies bring healing. Saying, "I was wrong, will you forgive me?" is the start of any relationship restoration. Demonstrating Humility & Vulnerability - It takes courage to admit to a child that you make mistakes. If I'm supposed to be the "grown up," doesn't that mean that I should be perfect? I don't like to admit my failures when I'm "in charge." This resistance to owning mistakes is called "pride." Pride creates gaps in relationships. Apologies toss pride aside and allow the other person to see your failings clearly. That's a vulnerable position for the parent doing the apologizing because it puts the child in the position of saying, "I forgive you," which is the next benefit. Practicing Forgiveness - 'Tis a bitter person who does not know how to forgive others. If you want your children to learn how to forgive, you have to be willing to give them opportunities to practice. That means that you need to ask them for forgiveness (as part of your apology) AND you need to demonstrate forgiveness when they learn to apologize to you. The goal is to say, "I'm sorry" before, as those One Republic boys say, "it's too late to apologize."